Imagine viewing the Atlantic Ocean from an entirely different perspective, from up to 600 feet above the water. You can do just that by going parasailing in Miami Beach. The views of the sandbars, sea turtles, manta rays, manatees and tropical fish will be sights you will never forget. But it’s not just the ocean that carries appeal, the view of South Beach, Ocean Drive, Miami Beach Marina, Biscayne Bay, Key Biscayne, the Art Deco District and Downtown Miami are also pretty remarkable. 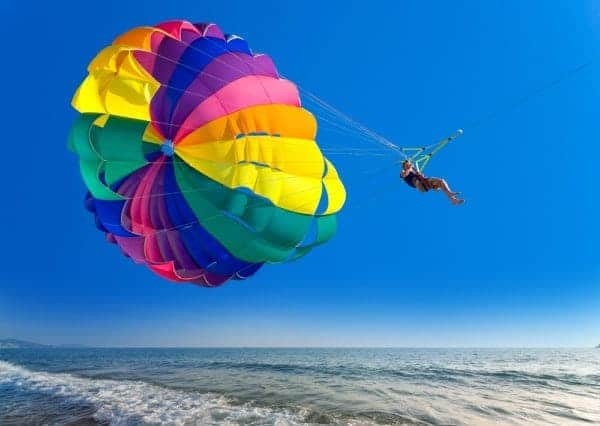 There are a variety of places where you can experience parasailing in Miami Beach and each offers an incredible experience that will make your vacation very memorable. Parasail Miami Beach offers fully trained crew members who pay close attention to every detail. You’ll undergo an instruction session prior to the flight where you’ll be briefed and you can ask any questions you have. At Parasail Miami Beach you will be lifted directly from the platform at the rear of the boat and held in a sitting position throughout the trip. But don’t assume this means you won’t be getting wet, you will as you get on and off the shuttle boat and if the ocean is rough you will on the parasail boat as well, but you may not get wet during the parasailing experience itself. You can bring your camera, but it’s at your own risk. Rather than damaging your equipment you can purchase a 25 shot digital photo package for $20 and if there are no additional parasailers waiting then observers are allowed along. The price at Parasail Miami Beach is $85 for a single or $150 for a couple. The boat ride is somewhere between 30 and 45 minutes long and the parasail flight is 7-10 minutes for singles and 10-15 minutes for tandems. Let’s Go Parasailing offers a variety of packages that let you experience the waterways of Miami for as long as you want. The full day, Parasail, Shopping and Dinner Cruise adventure includes two hours of unlimited parasailing, a trip south through the intercoastal waterways where you’ll see some of the big cruise ships and tankers that sail the seas and then you’ll be taken to the Bayside Marketplace for shopping and dinner. Bayside Marketplace can be a day’s worth of fun in itself so keep track of the time. Finally as your day winds down you will take a cruise down the Intercoastal at night for an incredible view of the skyline. For a Water Blast Boat adventure you can choose half day or full day trips full of adventure. Try parasailing, snorkeling, tubing, skiing, wakeboarding, sunbathing and island hoping. This vacation extravaganza for two includes a 30 foot boat and crew at your service. Do everything listed above or pick and choose your favorite adventures and do them as much as you want, all the equipment is already on board, so you’re ready to go. Simple parasailing fees range from $65 to 85, the shopping and dinner cruise is $595 for five yours and open to up to eight guests, and the water blast is $695 for a half day and $995 for a full day, this cruise can also accommodate up to eight guests. Island Hop gives you the same incredible views of the Atlantic Ocean and the skyline of Miami that make parasailing one of the most popular tourist attractions the city has to offer. The rides at Island Hop last about 15 minutes and cost $95 for a single and $75 per person for a double. But you can add so much more to your Island Hop experience by selecting a vacation package. The packages are designed for people who are looking for adventure, who want to experience all the water has to offer, or those who are looking for a beachside lifestyle. Let Island Hop work with you to create the best package that fits your lifestyle and interests. In addition to parasailing you can try your hand at deep sea fishing, jet skiing, snorkeling, scuba diving, sea kayaking, and you can even attempt a wild dolphin swim and encounter. Plan a day and an experience like no other and one that will leaving you talking about it for the rest of your life. Pinky’s Parasail is new to the Miami area but not new to parasailing, with more than eight years of international service under their belts and is a proud member of the Professional Association of Parasail Operators. Pinky’s offers single parasail rides, doubles and even triples so bring a group and ride together. At Pinky’s you take off from the back deck of the boat and you won’t necessarily get wet, although there is a free fall at the end if you’re interested where your feet will get wet but you will not get soaked. Experience the wonder of the Miami Beach area from up to 400 feet in the air as you soar over the ocean and take in all the magnificent architecture of the Miami skyline. The professional crew at Pinky’s Parasailing will put any fears you have to rest and you’ll be surprised at how relaxing and secure you feel as you soar above the ocean. There are a few other parasailing operations in the Miami area and it seems as though a new one crops up every year while another disappears. But no matter where you decide to go parasailing the important thing is that you decide to go parasailing, it’s an experience you’re sure not to ever forget and one that you may find yourself returning to time and time again.